Untamed Bengali tiger belongs to the highly accredited and well known Microgaming powered gaming series, the Untamed Series. As always, every game in this series is themed around a specific wild animal, this game has chosen the endangered species, the Bengali Tigers that live in the jungles of India. This is why as soon as players open the game, they will notice the jungle theme of the game that is based around the Bengali Tiger. 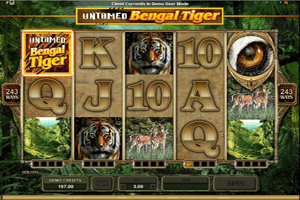 Play Untamed Bengali Tiger Slot here. The symbols that players will see on the game’s reels and lines include a Bengali tiger, a pack of tigers, the Bengali tiger’s eye, the Indian jungle, a group of dears, the logo of the game as well as card symbols that represent the low paying icons of the video slot. The Bengali Tiger logo is the game’s wild, so whenever it lands anywhere on the reels, players can rest assured knowing that it will help them get paid by substituting for any of the other icons. The game also has the lucky nudge feature that is triggered randomly that will enable players to nudge the symbols on a reel to help form a winning combos. The Tiger’s eye is the scatter symbols that can trigger the free spins bonus round that comes with the trailing wilds feature. On top of that, there is also a gamble feature that enables players to double up on what they have won.